On November 3rd, I took part in my very last volunteer trip. Over the 10 day trip, I tried to wrap my head around the idea that I have gotten to be a part of five volunteer trips. The other four trips all took place in the village of Dahakhani, but this November trip was in a village called Salgahaari. I was worried that our volunteers would have a harder time—I would have a harder time—and I did not know what a tube well project looked like. It turns out that my worries were for no reason. The volunteer team showed me exactly what all the volunteer trips have showed me—that there is a collective group of people who want to make a difference. They want to come get their hands dirty, love on people with no expectations and risk all the commodities we have in the U.S. to experience how more than half the world lives. Helping people is like a wonderful infection. Once you have infected someone with your love and service, they feel the need to spread that love and service to other people. 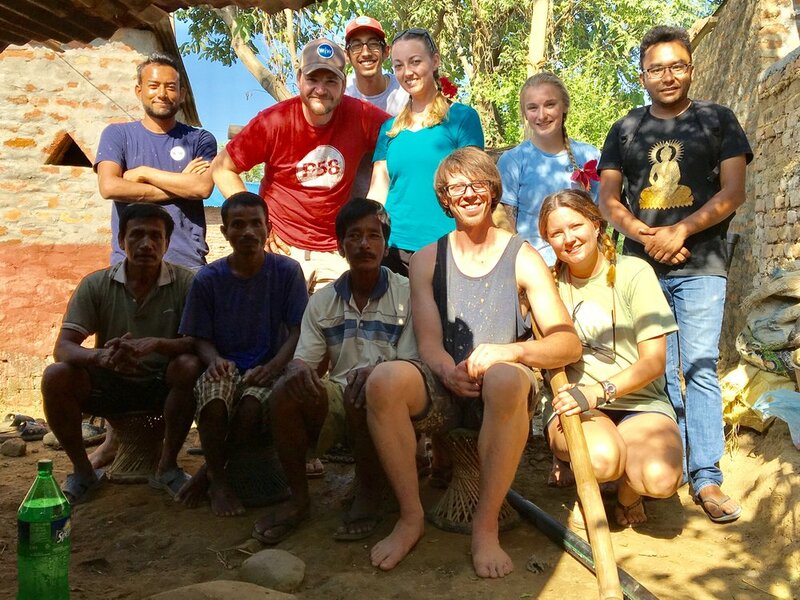 The volunteer team were from different backgrounds, but they came together to dig five new tube wells. We completed a well every day, and our mission was a success. The real joy of the trip came from the community engagement. We had villagers surrounding us each day. They would just laugh at us standing in muddy water slamming down a metal pipe into the ground. We would laugh at them when someone would say something funny about one of us. It was like we got to hangout in someone’s backyard for five days, and the greatest thing is that they had clean water after the party in the yard. We had one volunteer who was returning to this village from a previous trip last year. She was received as a family member! She would go off with villagers, and I would ask if she needed a translator. She would tell me no! I know that doesn’t sound too crazy in writing, but you have to think what this means to a villager in Nepal. A white women from the U.S. returned, and she wanted to come back to our village! She wanted to be with them, have tea with them and cry with them as she left. It was incredible to witness. I know this may seem more of a ramble than a specific story, but how can I put into words the incredible moments I have witnessed while leading volunteer trips? It is something that I want everyone to experience. I am incredibly thankful to Wine To Water and every individual I have met on these trips. If you are reading this, and you have not served in a community, do it. Life is made to take risks. Is it not better to risk a little time and sweat for a lifetime of change than to just sit back and remain the same? The answer for some of us is Wine To Water. But I believe that Wine To Water wants us to see an even bigger picture. We are called to serve in any community. It does not have to be traveling overseas. The service can be in our backyard. We just have to love the people around us, be grateful for the lives we have and remember people need help. Are you going to be the one to provide it?